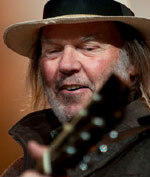 Neil Young has a project in the works that apparently includes an orchestra. The expected November 4 release titled Storytone involves the composer-arranger Chris Walden. Conductor Gina Zimmitti's Facebook page included photos of Young in a studio with her. Niko Bolas is evidently producing the sessions. He has worked with Young on a number of prvious albums, including This Note's For You, Fork In The Road and Living With War. Young tipped his hand in a Billboard interview when he discussed his interest in doing a minimalistic session with an orchestra - one that used a single microphone to capture all of the instruments.